Early in a discussion convened by LeBow’s Institute of Strategic Leadership, panelist and former associate director of the federal Office of Management and Budget Richard Nathan relayed a piece of advice he was given during his time in the Nixon administration: “In government, the less people who know about you, the more influence you can have.” The understated manner of the four very accomplished men on the panel seemed to indicate that the mantra still resonates many years later. 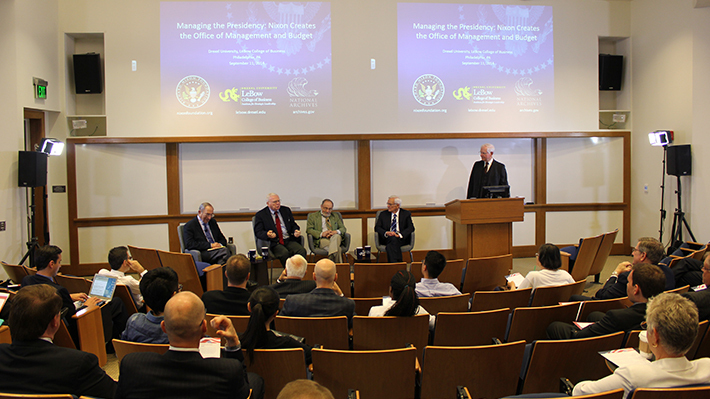 The event on September 11, 2014, entitled “Managing the Presidency: Nixon Creates the Office of Management and Budget” and co-sponsored by the Nixon Foundation and the National Archives, featured Paul O’Neill, Edwin Harper, Richard Nathan and Andrew Rouse. The men took different paths through academia and the corporate world, but they were gathered to discuss their pivotal roles in the forming of the Office of Management and Budget (OMB) during the Nixon administration. The OMB’s goal was to bring corporate management principles to the federal government. With moderation by former Department of the Treasury White House fellow Geoffrey Shepard, the men discussed their roles in the major policy decisions of the Nixon administration. They reflected on the unpopularity of some of their innovations within congress. They were at peace with their unpopularity in some circles, because as Nathan put it, “The only people who like change are wet babies.” And these are men who catalyzed a major change in the way the federal government managed its finances. The discussion remained focused primarily on the events of the late 1960s and early 1970s, with prominent names like Kissinger, Rockefeller, Nixon and Johnson peppered throughout. However, the panelists did note with pride that during the Nixon administration, the OMB achieved something that has eluded many presidents since — a balanced budget.